On March 25th, 1911 146 people died in the Triangle Shirtwaist fire. It was a Saturday afternoon and the workers were finishing up for the day. Most of the employees were women that were Italian or Jewish immigrants and worked 52 hours a week and were paid around $7 to $12 dollars. A week. Not per day, not per hour, but per week. In today’s dollars that would be around $3.50 to $6.00 an hour. They were not allowed a break to go outside and smoke or catch their breath for the entirety of their day because the doors of the factory were locked in order to discourage these poor employees from stealing. So when some of the cloth caught fire in the factory, there was no where for these people to go. The factory was located on the 8th, 9th and 10th floors of the building and some workers, desperately trying to escape the smoke and the flames climbed out the windows and tried to hold on to the ledge until help arrived. Many were unable to hold on that long. When the fire department finally set up nets, they found them useless against the length of the jump. One woman went to the window ledge and flung off her wide brimmed hat, then flung the few bills and coins that were in her handbag out the window and jumped. A young man helped three women get to the ledge so that they could jump and when a fourth was hoisted up, she wrapped her arms around him and kissed him before jumping, then he followed her. And Frances Perkins witnessed all of this. Frances Perkins came from good upper middle-class stock. She held bachelor’s degrees in chemistry and physics and a master’s in political science. She was attending an afternoon tea with friends when they saw the fire trucks on their way to the fire and they decided to investigate. 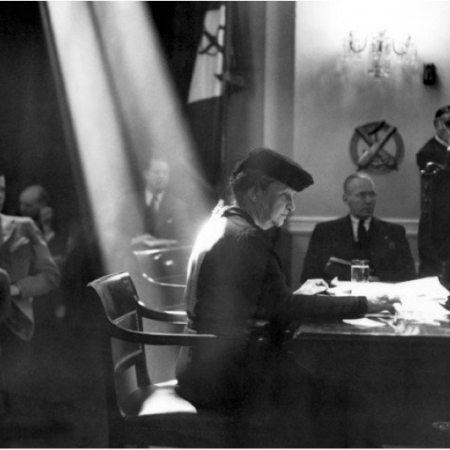 Watching those people struggle for their lives and fail changed Frances Perkins forever. It was the moment when she decided to dedicate her life to workers’ rights. Miss Perkins had been advocating for better working conditions before the Triangle Shirtwaist fire. She led the New York office of the National Consumers League where she worked on better working conditions and wages for women, child labor laws and workplace fire hazards. She was no stranger to the awful conditions that laborers faced in her time. It was her belief that the poor treatment of the labor force was part of the reason the economy was not doing so well. Intellectually, she had been doing this work already. But something changes when you witness tragedy first hand. It’s no longer something that happens to other people, it’s not just a story on the front page that will be forgotten with the next edition. It becomes real. When Frances Perkins witnessed the Triangle Shirtwaist fire, she was 31. When you hit your 30’s is about the time your youthful idealism starts to become replaced with a more world-weary practicality. I can’t say that Frances Perkins, a suffragette and labor activist, was beginning to slow down. But I do know that she pointed to that moment of her life as the moment that solidified her commitment to labor rights. Frances started to work with local government officials, convincing them slowly to start passing laws that protected the labor force. As her efforts became more successful she started to gain more attention from those within the state which won her different state appointments. In 1929 she became the first Commissioner of the New York State Department of Labor, appointed personally by the newly elected governor, Franklin Roosevelt. When Roosevelt become president, Perkins joined him as the Secretary of the Labor Department. She was the first woman to serve on the presidential cabinet, the first woman to be in the line of succession for the president and was instrumental in the New Deal. Perkins helped draft the Social Security Act, and was instrumental in legislature ensuring a minimum wage, a 40 hour work week, a two day weekend, overtime laws, child labor laws, and welfare. If you are able to take a long weekend this weekend, thank Frances Perkins. And if you are able to take tomorrow off, take a minute to remember the 146 people, mostly young female immigrants, who died in the Triangle Shirtwaist fire. That is what this weekend is about, the people who move the economy of our nation. The holiday started in the late 1800’s, about the same time the country’s economy was moving from agricultural into industrial. How we worked was changing and just like any change, there was some grumbling at first, so we create a holiday to make the change seem less scary. Change in systems can also lead to abuse. It was common to lock factory doors to prevent workers from stealing at the turn of the century. Child labor wasn’t frowned upon because children had been working the fields with their family farms forever. These things happened because industry was new and they had no idea how run a factory. The owners were only interested in making a profit and there was a large pool of immigrants to choose from. Workers were expendable. If they wanted better jobs, they should go find them. A hundred years ago, our country moved from an agricultural economy to an industrial economy. Today our economy is facing another change. We are moving from an industrial economy into a service economy. According to US Department of Labor (the same dept Frances Perkins headed) 40% of the US work force is classified as either management or professional. That would be your professors, social workers, librarians, nurses, doctors, lawyers, ministers etc. 39% of the workforce is sales, service, and administrative staff. That would be cashiers, waiters, prep cooks, nurse assistants, hotel housekeeping, baristas, data entry, customer service and the like (The other 20% consists of transport workers, construction, farming and other natural resources). There are just about as many “professionals” as there are “laborers” in this country. And just like 100 years ago we are trying to figure out what a fair and just workplace looks like. Let’s start with the idea of a minimum wage. The federal minimum wage is $7.25/hr. that means if you work 40 hours a week for 52 weeks you will make $15,080.00 a year, before taxes. Can anyone of you here live independently on $15,000 a year? I very much doubt it, yet that was what the minimum wage was intended to do. FDR said, “No business which depends for existence on paying less than living wages to its workers has any right to continue in this country. By “business” I mean the whole of commerce as well as the whole of industry; by workers I mean all workers, the white collar class as well as the men in overalls; and by living wages, I mean more than a bare subsistence level, I mean the wages of a decent living.” The minimum wage isn’t about teenage seasonal help, it’s about giving anyone who works an opportunity to have a decent life, to treat them with the worth and dignity they deserve. I’m sure many of you have heard about the Fight for 15, it’s a group that is supporting a minimum wage increase to $15/hr, more than double what it is now. When I first hear of it, I was a little stunned by the demand. $15/hr seems like an awful lot, but then I did the math. A one bedroom apt in this neighborhood is almost 15 hundred a month. Lets say utilities are $200 a month (electric, water, trash). You have a health insurance payment of $220 a month (and that is bare bones coverage). $300 a month for groceries and $250 a month for a car payment and insurance. That puts you at $2,470 a month. Guess how much you need to make per hour to cover that. $15 an hour. And notice we did NOT include such things as Netflix, Starbucks or cell phone service. Nor did I include internet service, clothing expenses or gas for the car. And child care? Forget about that, that is an extra $400 a month if you are willing to leave your child at one of the low rated, non-accredited, childcare providers. Whether or not you agree with the $15/hr minimum wage, I think we can agree that $7.25/hr is not enough to live on, but what about other modern work place abuses. Let’s talk about sick days. While different employers have different standards about the number of sick days and when you can use them, many low wage employers make it very hard to call in sick. Often they will require a doctors note from employees, which in their mind deters people for calling in sick when they really aren’t. However, with the poor insurance plans that have large co-pays, employees can’t afford to go do the doctor for a bad head cold that requires a day of rest. So what do they do? They go in sick and infect everyone around them. If you are a parent, you have to use your sick days for your child as well, day care providers will not take a child with a fever. And I know from personal experience that employers don’t like that. I was working with a small company that bought and sold used camera equipment. They had just under 50 employees. My daughter at the time was about 3 years old and had been battling a pretty bad cold, so I spent a few days with her at home. When she wasn’t getting better, we took her to the pediatrician who hospitalized her for dehydration. My wife was teaching elementary school at the time and making more money than I did, so she went to work and I stayed with my daughter for the next two days, missing four days of work. For the next two years, they refused to give me a raise, despite stellar performance reviews, because I was not, in their words, “a company man” because I took time off to care for my child. I was lucky. If I had been working in the food service or retail industry, I would have been fired for missing so many days in a row. It happens. Retail and service workers have a lot of similarities to the factory workers a century ago. They are over-worked, under-paid, work in dangerous conditions, and are considered easily replaceable by those who employ them. They need a Frances Perkins. Frances Perkins was an amazing individual. In a time where women were not allowed to vote, she found a way to effect change. She used the connections she had made early in life, her incredible talent and her tenacity to bring about change. But the most amazing thing about Perkins was that she saw pain and suffering and injustice, and she allowed herself to be changed by it. She allowed herself to feel the pain and suffering of others and that was what called her to action. That is what Labor Day should be about. Not a celebration of the labor force, but a witness to the injustices that it perpetuates. It should be a call to action. A call to make sure that all who work are treated with dignity. That they can afford decent housing, decent food and clothing. That they don’t just survive but thrive in this world. So who will be our next Frances Perkins? Who will shoulder the burden of making labor just and fair? I have good news for you, it doesn’t have to be any one of you. But I have bad news for you too, it does have to be every one of you. There are lots of little things we can do to place the first principle of inherent worth and dignity into the labor market. First thing to do is vote locally. Support people who support unionizing service industries like retail and fast food and an actual living minimum wage. Shop as much as possible at businesses that pay their employees justly and don’t assume that all small businesses do this. If you are a small business owner, pay a living wage. It might be difficult, but you’ll find that you are able to keep better employees for longer. And as members of this congregation, make sure that all who work here are paid a living wage too. From the senior minister all the way down to the sextons. And there is only one group out there that can make sure the church pays a fair wage, those who pledge. We live in a nation that often defines people by their work. It is often one of the first questions that we ask when meeting someone new. People who run cash registers, wait tables and prepare food shouldn’t be treated like their jobs are beneath them, after all they make up almost 40% of the American workforce. Those jobs are vital to our every days lives and they deserve to be compensated fairly, because the people who do these jobs are just as deserving of respect, justice and compassion as everyone else.